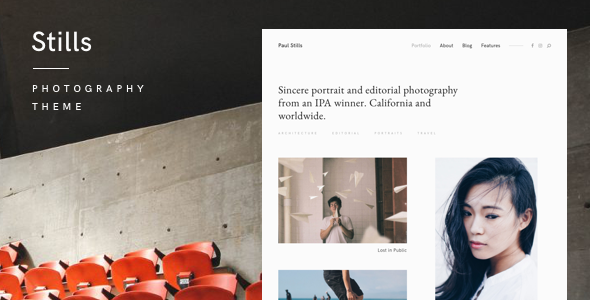 Stills is a photography WordPress Theme with smooth minimalist aesthetics and simple lean UI design. Its innovative scattered layout lets you keep your images uncropped (yes, this theme literally does not crop photos). The irregular magazine-like grids of this WordPress theme are a great match for a professional photography portfolio, an architect portfolio, an illustrator portfolio, a creative agency portfolio, a freelancer portfolio and more. The refined looks of this theme’s minimalist design combined with a no-image-cropping experience work nicely for fashion u0026amp; lifestyle photography, fine art photography, conceptual photography, architecture photography, landscape photography, nature u0026amp; wildlife photography, commercial (e.
Stills — A Focused WordPress Photography Theme has been tested with browsers IE11, Firefox, Safari, Opera, Chrome, Edge.